Desire Under the Elms. Photo by Pat Bromilow. 2016 marks the centenary of the year Eugene O’Neill began writing ground-breaking plays in Provincetown, considered the birthplace of modern American theater. This year, the 11th Provincetown Tennessee Williams Theater (TW Fest), September 22 to 25, will offer new approaches to staging O’Neill from the perspective of Tennessee Williams’ genre-busting dramas. Both playwrights thrived in Provincetown’s atmosphere of artistic freedom. O’Neill is recognized as the first American playwright to break through the conventions of form and language of the American theater of his time, winning the acclaim of Broadway audiences and critics. Twenty-five years later Williams was highly lauded when he broke through the conventions of his own time. But beyond success, they were both more daring in works that weren’t as appreciated. Some of the season’s shows include a production of O’Neill’s Desire Under the Elms coming from South Africa with a diverse cast; the dynamic and athletic The Hairy Ape from Philadelphia; Marco Millions with a cast of musician/actors; as well as Williams’ A Perfect Analysis Given by a Parrot performed with puppets and live actors and In the Bar of A Tokyo Hotel, an avant-garde production from New York, directed by Everett Quinton, from The Ridiculous Theater Company. The story of O’Neill’s 1924 tragedy about a stepson’s passion for his stepmother is set in New England. 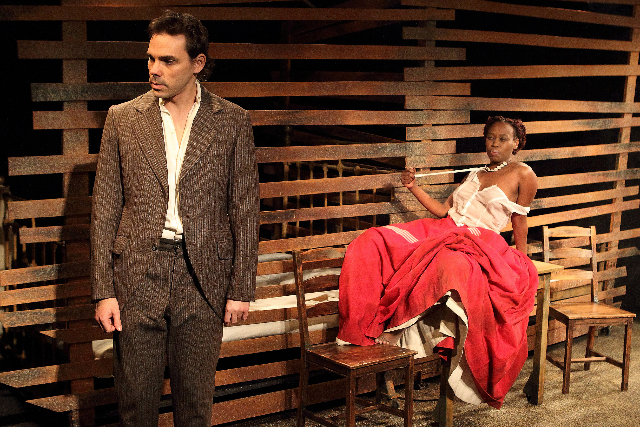 South Africa’s Abrahamse and Meyer Productions moves the play’s setting to Cape Town where a Boer farmer brings home a black bride. Afrikaans-inflected English brings new musicality to O’Neill’s spare dialog of repression and release. Festival audience favorites Abrahamse and Meyer Productions have brought their award-winning interpretations of Williams’ plays to past Festivals, including The Milk Train Doesn’t Stop Here Anymore and Kingdom of Earth. A debutante visits the underbelly of her luxury ocean-liner to observe the soot-covered workers as if they were animals. The revelation of his low social status tragically upends the self-perception of the coal stoker boss. O’Neill’s daring 1922 text vaulted beyond the realism of his earlier plays to forcefully dramatize the human cost and terror of the rapidly mechanizing twentieth-century. Defiant and stirring, the athletic, critically acclaimed 2015 production from Philadelphia’s EgoPo Classic Theater is directed by Brenna Geffers. A burlesque retelling of the life of Marco Polo casts the 14th century Italian adventurer as an avatar of a Roaring 20’s tycoon. O’Neill’s take-down of an American value system, in which making a profit trumps all else, stings ninety years after it was written. The Here and Now production is performed by a band of musician/actors and directed by Talya Klein. Klein is a graduate of the Brown University/Trinity Rep MFA Program. She is the founder of The Here & Now in Vermont, which produces one-off, site-specific theatrical events there, and now here for TW Fest’s Marco Millions. O’Neill’s groundbreaking 1920 play, Anna Christie, reveals a woman whose life is a performance: daughter, lover, whore. In this production, three actors from Central Russia and a virtuoso Russian pianist reimagine the story through dance, song, Russian dolls, and dialogue. Tango Christie is adapted from Anna Christie as well as directed by Alla Korovkina. It will be performed in Russian by Dr. Chekhov’s Theater Ensemble with over-sized titles projected in English. Original music and songs are by pianist/composer Vasily Tonkovidov. The choreographer is Victoria Maximova. A happy hedonist wife has come to the end of her patience with her husband, a forever-experimenting artist. The late 1960s resounds throughout Tokyo Hotel in masterful staccato rhythms, which serve as breaks in the lilt of Williams’ earlier dialog, like a hesitation waltz. The legendary Everett Quinton, of New York’s seminal Ridiculous Theater Company, directs Regina Bartkoff and Charlie Schick’s 2012 East Village cult production of the play. Last year’s Festival audiences will recognize the themes of Williams’ The Day On Which A Man Dies which he wrote a decade later, inspired by what he’d learned about Noh Theater from Yukio Mishima. In this play Williams sets up camp on O’Neill’s turf: a bar at the edge of the world, shrouded in ocean fog, in which a collection of misfits huddle like birds evading a storm. Unlike O’Neill’s eternally damned pipe-dreamers, Williams’ crass menagerie of barflies -- an itinerant beautician, her loutish boyfriend, a lovesick short-order cook, the girl he’s love with, and an alcoholic doctor -- survive on hope and the possibility of heaven. This production is directed by Patrick Falco, featuring Gail Phaneuf and Joe Macdougall. In this dark comedy, an Irish hustler, married to a Lutheran preacher’s daughter, brings up his nubile children to sell in the priciest neighborhoods of Manhattan. The title is Williams’ twist on the German admonition that women devote themselves to children (kinder) kitchen (küche), and church (kirche). The Festival offers the first production of this raucous song-filled comedy since 1979, the year Williams wrote it. It will be workshopped by our Tennessee Williams Institute partner, Texas Tech University of Lubbock, Texas. Directed by Robertson Dean, featuring Rachel Hirshorn as The Wife. Thomas Keith, who worked with Eve Adamson, the original director of the play, will serve as dramaturg. These paired plays explore the two playwrights’ understanding of a good-time girl. Williams introduces us to two ageless goodtime girls out for a good time in a desolate East Saint Louis juke joint. O’Neill’s understanding of a good-time girl was quite different – a scene from Welded stands alone as a moving portrait of unexpected redemption when a footsore young streetwalker teaches an errant young husband how to get through life. Directed by Fred Abrahamse for the Festival and performed with puppets and panache by South Africa’s Marcel Meyer and St. Louis raconteur Ben Watts. For Saloon Songs, the artists of the Festival will sing to live accompaniment in saloons around town. Expect stirring, sentimental, sexist and sometimes silly songs -- including barroom standards “Danny Boy” and “Whiskey Johnny” – which were written in stage directions by O’Neill and Williams. These were sometimes placed satirically or meant to carry emotions that cannot be spoken onstage. John Thomas is the director and accompanist. Also expect a visit to our saloons by Stage Moms -- Eugene O’Neill and Tennessee Williams mothers -- written by Larry Dean Harris featuring Paula Fins and Mil Nicholson. ­­“We have a lot of fun, but we also explore the deeper, more profound aspects of the drama of these master playwrights,” Hall-Flavin continued. This year, O’Neill biographer and scholar, Robert M. Dowling will be joining returning Williams’ scholars Thomas Keith and Annette Saddik at TWI. Dowling, serves on the editorial board of The Eugene O’Neill Review and the Eugene O’Neill Society board of directors. His biography, Eugene O’Neill: A Life in Four Acts (2014), has earned accolades for cultivating new insights into the life the Pulitzer and Nobel Prize winning American dramatist and was a finalist for the prestigious LA Times Book Prize. He is Assistant Professor of English at Central Connecticut State University. TWI is also honored to be hosting special guest Lee Breuer, founding co-artistic director of New York’s Mabou Mines. Breuer is a writer, director, poet, and playwright engaged in a lifelong procession of experimental theater projects including the smash hit interpretation of A Streetcar Named Desire at the Comédie Française in Paris in 2011. This year the Fest spotlights the illustrations of Miguel Covarrubias, born in Mexico City in 1904, who created a body of work that broke through conventions of subject and style throughout the 1920s and 1930s. Covarrubias’ artwork and caricatures of influential politicians and artists were featured on the covers of The New Yorker and Vanity Fair. A personal friend of Eugene O’Neill’s, with whom he visited Harlem during its 1920s Renaissance, Covarrubias was introduced to New York bohemian society by Carl Van Vechten, the author, critic, and portrait photographer. A decade later Van Vechten would photograph Tennessee Williams and his circle of friends. Other artists whose work will be exhibited during the Festival are: Julianne Papetsas who has been commissioned to commemorate the Festival’s events with woodcuts that memorialize the original Eugene O’Neill productions; Bill Evaul, whose white-line woodcuts represented Tennessee Williams and his plays during the 2012 and 2013 seasons and who this year creates a woodcut of Eugene O’Neill; and photographer Ride Hamilton who has documented the backstage life of Festival performances from Mississippi to Manhattan since 2012.